Former Westlife star Nicky Byrne confirmed he is to step off his stool and take to the floor as a contestant on Strictly Come Dancing. The Irish singer, whose group split earlier this year after a 14-year career, will be on the BBC1 show when it launches on September 15. He and the rest of the band rarely had to trouble themselves with dance routines as they famously performed their string of 14 number one hits while perched on stools or while standing. 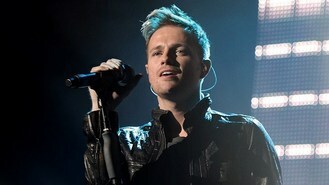 Nicky, 33, confirmed his appearance while appearing as a guest on BBC1's The One Show. Speaking about his involvement with the hit dance series, Byrne said: "It feels strange. I mean I'm excited, scared to death. Most of my dance career has been spent sitting on a stool with Westlife." After One Show presenter Alex Jones pointed out that their routines largely involved simply getting off their stools, he joked: "We perfected that, I would say." He admitted he was already a bit daunted by the costumes they will need to wear for the show. Byrne said: "We were over last week and we met all the contestants and we met all the wardrobe girls who had plenty of fun putting some stuff on us. They made us put on this sequinned diamante vest, with no material only diamantes and I thought you're never going to see me in that." Actress Dani Harmer, star of the BBC's Tracey Beaker drama, has already been confirmed as a contestant on the show, as has Daybreak's Richard Arnold. Others understood to be taking part include Johnny Ball and ex-cricketer Michael Vaughan, while Olympic track cycling star Victoria Pendleton is thought to have been in discussions and has expressed an interest in appearing on the show. Many of the stars have already been in rehearsals, ahead of the full line-up being announced early next week. Joe McElderry has told a court that he was left feeling scared and intimidated by a man accused of stalking him and his mother. Music veteran and Eurovision entry Engelbert Humperdinck has been chosen to perform for Tibetan spiritual leader the Dalai Lama. Legendary soul singer Stevie Wonder will be the closing act of the last major music festival of the year. A man allegedly clutching a pair of scissors has been arrested by police after allegedly trying to force himself inside the Los Angeles home of Miley Cyrus. Girls Aloud singer Kimberley Walsh is the latest celebrity to be unveiled as a contestant in the forthcoming series of Strictly Come Dancing. Thousands of revellers have put on their fancy dress as the sun shines down on the Bestival music event. Sir Paul McCartney has been presented with France's highest public award, the French Legion of Honour, for services to music. Thousands of revellers will be donning fancy dress as the Bestival music event prepares to hold its famed dressing up parade. Lady Gaga may have been absent from the MTV VMAs, but she revealed she was watching the ceremony from home.